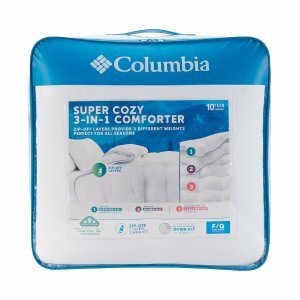 Kohl's offers the Columbia 3-In-1 Down Alternative Comforter for $34.98 via Cardholders coupon code PINK30 . Features: This versatile Columbia 3-in-1 comforter is perfect for all seasons. Use the lightweight layer for warmer nights, the heavyweight layer for cooler nights, or zip them together for maximum warmth and comfort on those cold winter nights. In white.